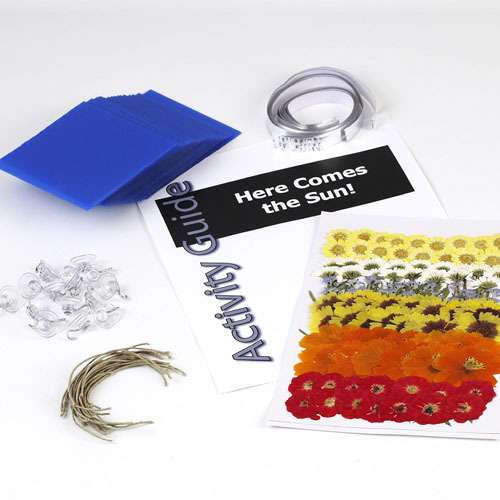 Environmental science comes alive with lessons built around Nature Watch activity kits! Each lesson includes a hands-on project designed to engage, enlighten, and enliven the learning process. Each course covers one important topic like animals, ecosystems, climate, and more. To further promote discover, all kits include a craft so each participant can “make and take” their project home. Activities are fully aligned to NGSS, advance 21st century science education and are mapped for STEAM extensions. 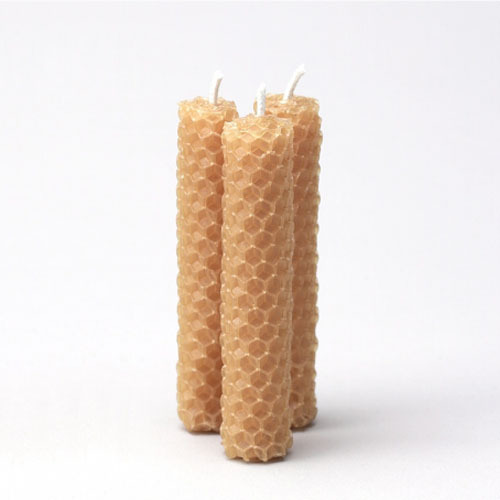 Make your own honeycomb candle! Taste real honey made by bees! This amazing Nature Watch Activity appeals to each of the 5 senses. If it’s one insect that kids know a little bit about… it’s bees. But most kids only know about the part that hurts. Honey bees are fascinating creatures to study and they play a critical role in our food chain. This kit contains real honey. Please be aware of any participant who may be allergic. Learn about the colonies that honey bees live in and the role that workers, drones, and queen bees play. Discover how bees make honey and honeycomb, and what they use it for. Feel a piece of honeycomb and taste real honey! Frogs are really amazing animals! They can lay about 2,000 eggs at one time. They don’t drink – instead they absorb water through their skin. They undergo an amazing transformation throughout their lives. 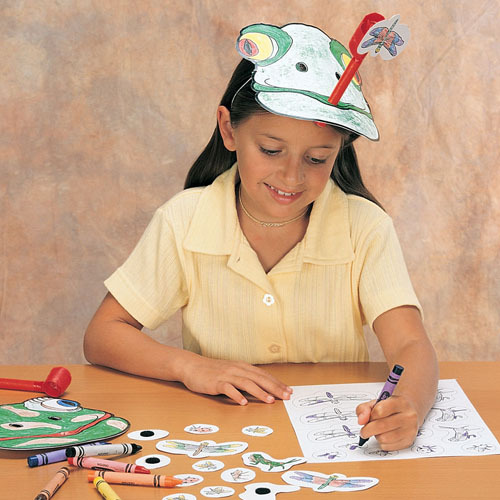 Kids love to learn about frogs! 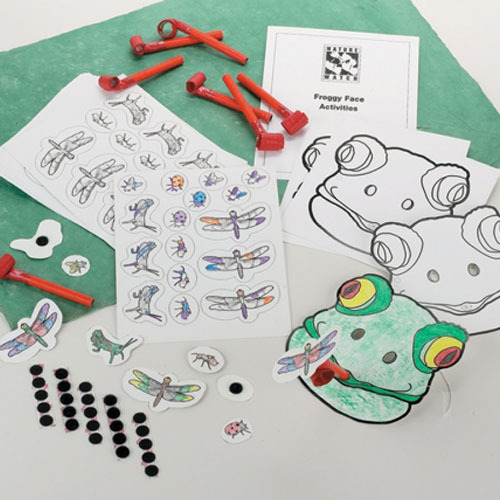 The Froggy Face activity features custom designed frog masks that kids get to color, party blowers that act as froggy tongues and cut out sheets with loads of bugs. 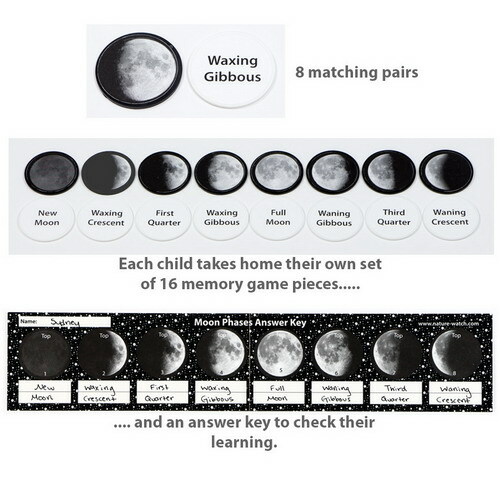 This is a great activity that works because it involves its participants so completely. Discover the reasons why these cold-blooded amphibians are so interesting. Understand why the frog population is being threatened. Discuss the life cycle of the frog – its metamorphosis from a tadpole to an adult frog. 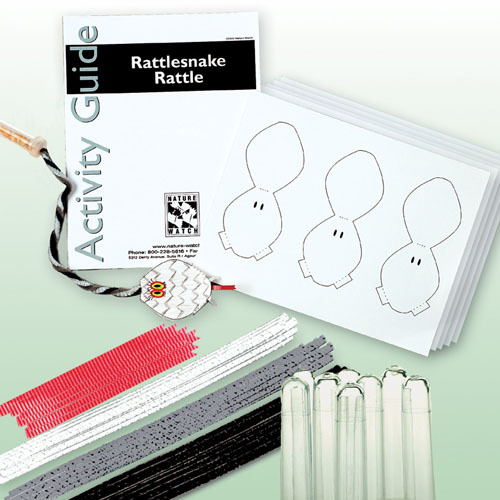 In the Rattlesnake activity, kids make a rattlesnake that really rattles as they learn about these amazing creatures. Twist rattlesnake-colored pipe cleaners into a rattlesnake head, attach a special vial filled with some popcorn kernels, apply some appropriate coloring and you have a rattling rattlesnake! There is even a ribbon for a special snaky tongue. Find out about the features of rattlesnakes that make them so fascinating. Learn about a variety of different rattlesnake species. 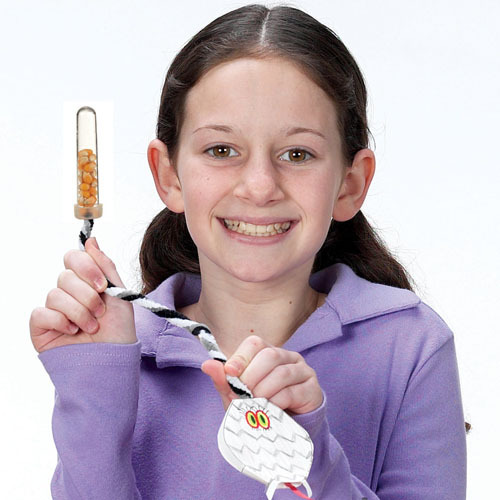 Play and participate in fun rattlesnake activities. Food chains demonstrate the amazing interdependence that exists within nature. From sunlight and photosynthesis to plants and animals, food chains are critical to our ever-changing natural world. The Food Chain activity teaches children about the importance of food chains and provides a model for them to create and take home. Color, cut out and glue the images onto the 5 tubes which represent different links in the chain; then, starting with the smallest, have each member of the model chain ” eaten” by the next until all of them are “consumed” by the top member. 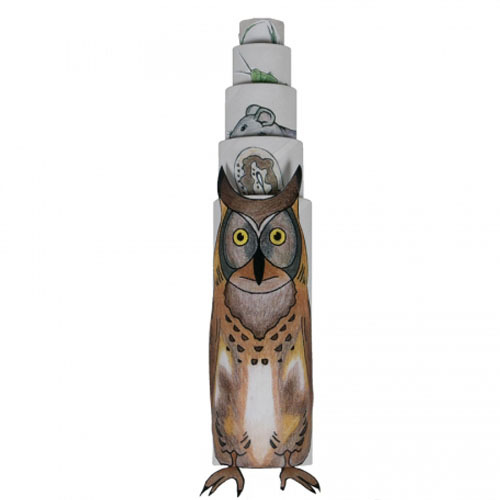 Each tube ” nests” within the next to vividly illustrate how a food chain works. Introduce the concepts of food chains. Discuss the different levels of a food chain, and the organisms that below to each. Create a Food Chain model that will allow children to visualize and “play with” a food chain. Make a real working butterfly feeder disguised as a flower! Kids love butterflies! They are beautiful, delicate insects that flutter through our gardens, schoolyards, and camps in spring and summer. Not only are they fun to watch, butterflies also play important roles in their ecosystems. Butterflies are pollinators which make them important players in the food chain. The Butterfly Feeder activity is a great way to make learning about nature and science so much fun! Designed to look like a flower, each part of the feeder plays an important role in attracting butterflies. Hidden from view inside the green “stem” is a bottle that contains a liquid (non-toxic) butterfly attractant. The red color in the center of the flower is a special fabric that wicks the attractant upward and remains saturated with the attractant. The yellow die-cut flower petals (butterflies love yellow!) provide a safe landing spot for the butterflies to rest while feeding. 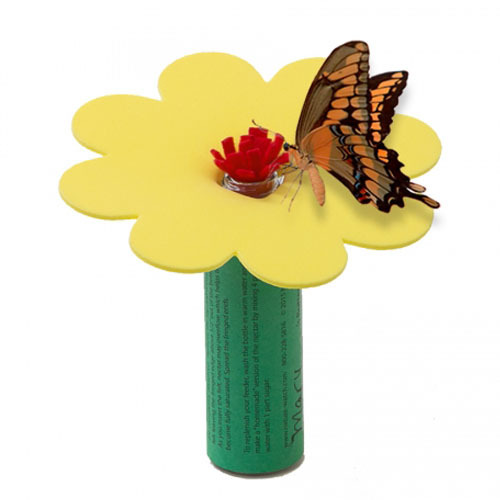 Create the flower craft, then place it in your garden or near a window so that you can enjoy watching the butterflies as they land and eat from your feeder. Children love hummingbirds! With wings that normally beat up to 78 times per second (and can beat as fast as 200 times per second), hummingbirds have an almost magical charm. But hummingbirds aren’t just playful creatures. Hummingbirds are pollinators and therefore play a critical role in the environment. In the Hummingbird Feeder activity, each participant assembles their very own feeder. 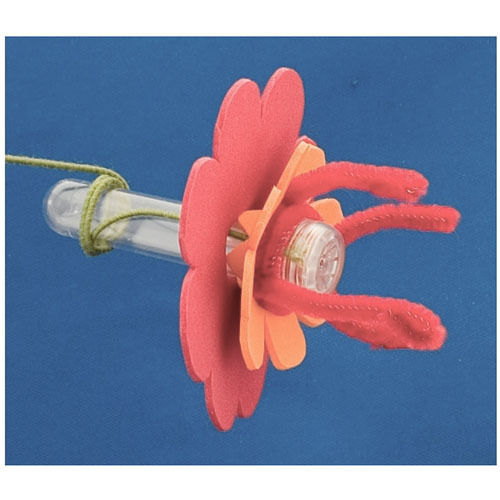 First they build a gorgeous flower craft around a special tube that will hold the “nectar”. Hang the feeder outdoors and watch as hummingbirds are attracted to the red and orange colors and extract the nectar with their long bills. A great craft AND a real, functional hummingbird feeder! 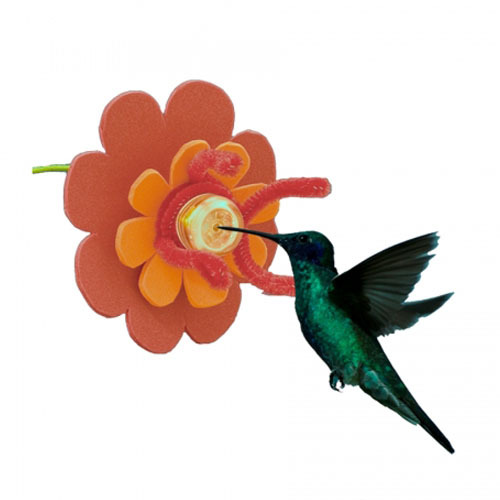 Introduce participants to the wonderful and amazing attributes of hummingbirds. Understand how and why hummingbirds are able to fly differently from all other birds and why this is important. Learn about hummingbirds role in pollination and the food web. Create a beautiful and functional craft! Kids are so amazed by insects and other arthropods! Did you know… Cockroaches can live without their heads for 9 days. The largest spider has an 11″ leg span. 95% of all animal species on earth are insects. Fleas can jump a man’s equivalent of 900 feet. Insects are unusual, amazing, strange, cool, weird, and unique – no wonder children are so fascinated by them! 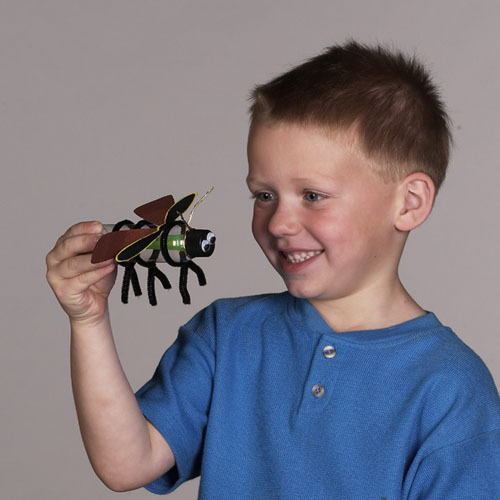 The Incredible Insects activity increases awareness of “bug life” as young entomologists learn to identify the major groupings and the similarities and differences between insects and other arthropods. 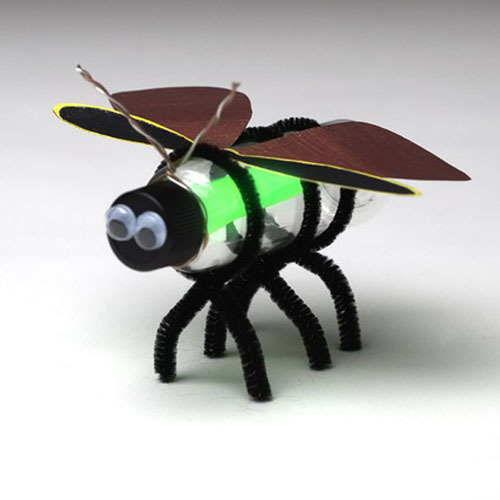 The Incredible Insects activity provides a “glowing” firefly craft to reinforce the learning! Each participant decorates a body and wing pattern, applies antennas and inserts a glow stick. Turn out the lights and you have a fantastic firefly! Increase awareness of various insect life forms. Define arthropods and determine major groupings. Find out what differentiates insects from other arthropods. Complete Metamorphosis is one of nature’s mysterious wonders — you have to see it to believe it… and now your students can! 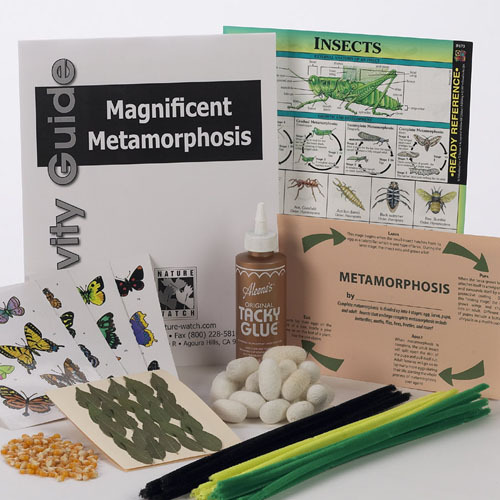 The Metamorphosis kit represents each stage of the butterfly/moth life cycle. From a small egg on a leaf to a caterpillar; and then from a cocoon (which is REAL!) 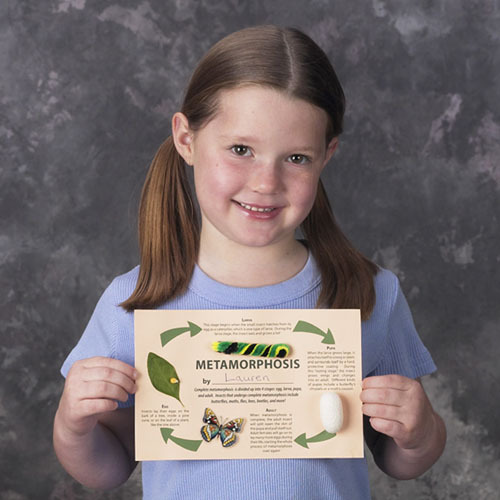 to a beautiful butterfly or moth, young entomologists will be excited to make a metamorphosis card of their own! Know which insects go through complete metamorphosis. 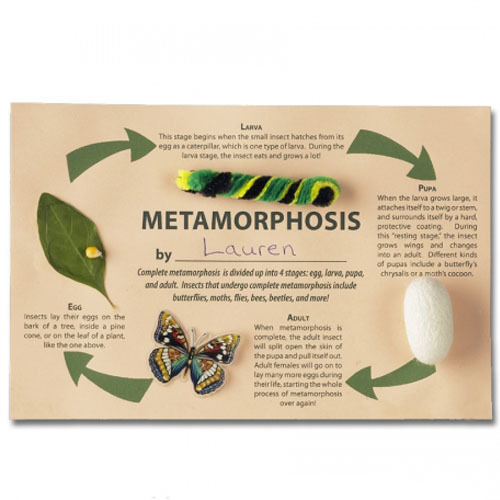 Develop an understanding of the stages of metamorphosis by making a Metamorphosis Card, complete with a real cocoon. Identify the body parts of insects. Bats are amazing mammals. They fly, use sonar, sleep upside down and can each eat up to 5,000 insects per evening! This amazing project provides everything you need to create bats that fly, eat and sleep. 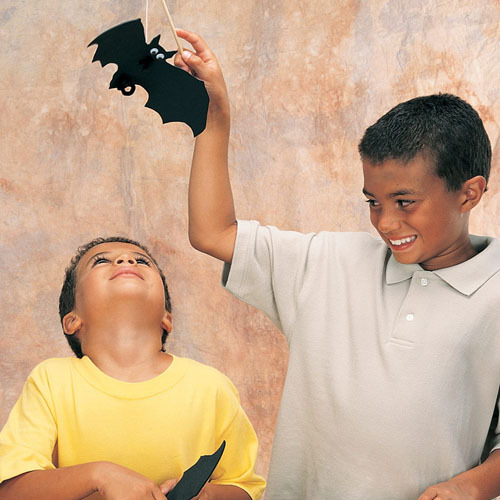 Take your bat off the branch and it dances about with the tapping of a finger. Understand the differences between different types of bats. Discuss the habitat of bats. 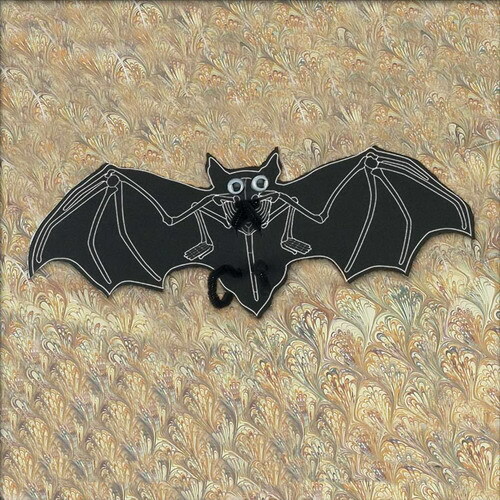 Create a bat with eyes, feet, wings that close, a “branch” to hang from and a magnetic mouth for “eating” paperclips. Learn about different parts of a bat’s body. Spiders are amazing! From the Spiderman cartoon and Charlotte’s Web to the movie Arachnophobia, these creepy crawlers have always fascinated people. What’s most unique about spiders is the way they catch their food; no other animal can spin beautiful tapestry webs. Here’s a great project with a dual purpose! 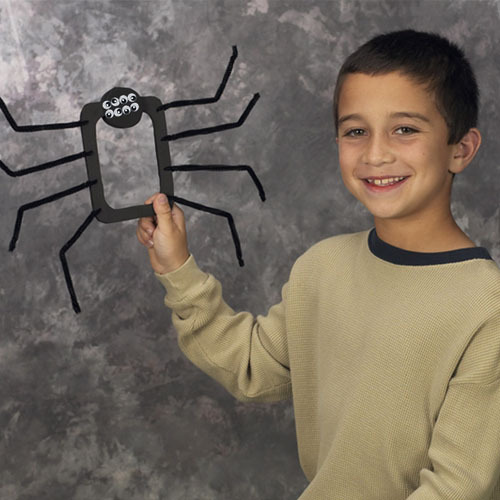 On the one hand, it’s a really cute spider craft that kids can make to gain an understanding of some of the distinctive features of a spider’s anatomy. But wait, there’s more! Hang it from a tree or plant, and the open ” frame” serves as a canvas on which a spider can spin her web. Then watch as your new “spider pet” catches flies and climbs down her web to eat her prey! 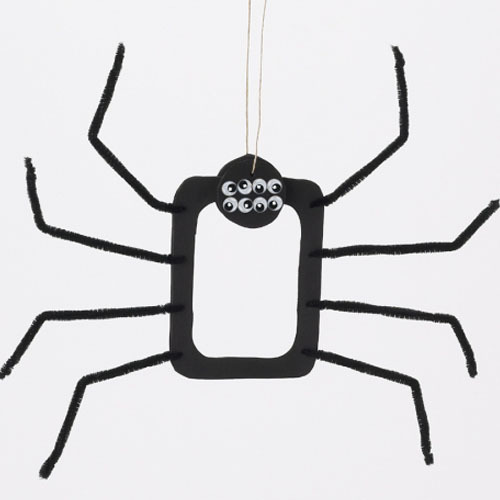 Introduce spiders and other arachnids to your participants. Understand how and why spiders make webs. Discuss the different body parts of spiders. 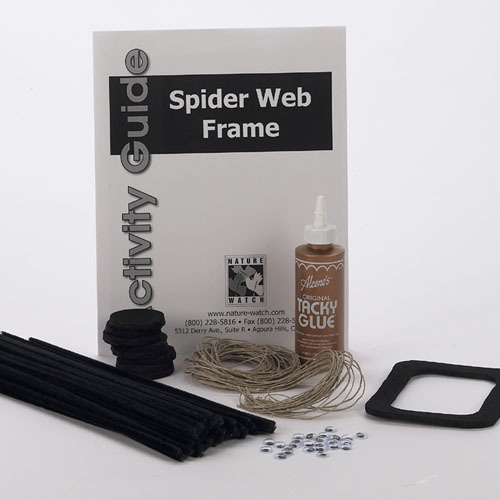 Create a spider web frame. Take a trip through space with our Solar System activity. 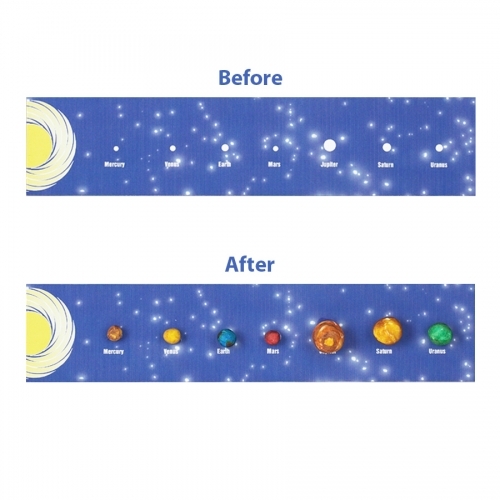 Kids learn about each planet in the solar system by building their own solar system panel. They’ll be amazed by interesting facts about each planet, including the difference in gravity between the planets. Compare and contrast numerous features of different planets. Gain an understanding of our place in the solar system. Build a replica solar system as a take-home project. Understand the ” three R’s” and how they impact our lives. 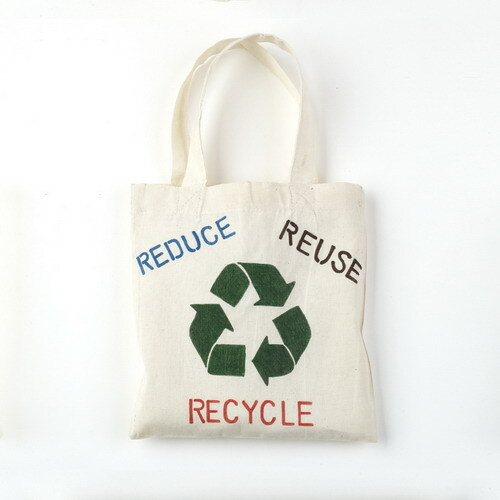 Learn ways to help recycle and improve the Earth. Develop an understanding of where our trash goes, how global warming is affecting the Earth, and more. Native Americans loved music and made it an integral part of their cultures. They would make instruments out of natural materials they could find near their homeland. Kids recreate the experience and learn about music and Native American culture as they craft their own Shell Shaker instrument. Plus, students will hear a specially produced CD featuring 21 songs from 12 Native American tribes. Explore the rituals and ceremonies of various Native American tribes. Learn about different Native American tribes and then listen to songs from each tribe. Create your own Native American inspired instrument. Seashells are beautiful and provide wonderful opportunities for learning about classification. 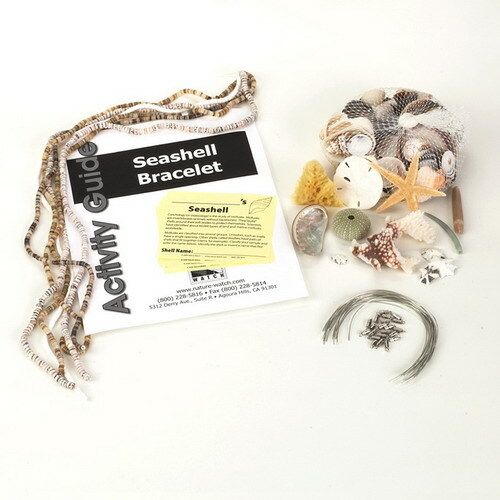 The Seashell Bracelet activity introduces future conchologists (shell scientists) to the idea of classifying marine organisms. First, participants select, name and learn to classify a shell of their very own. 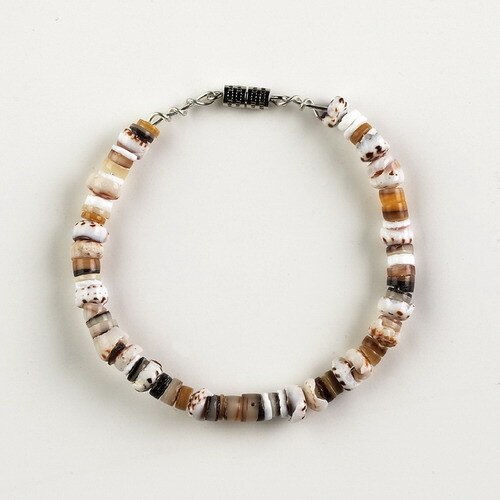 Then they string real drilled seashells to make an all natural bracelet (complete with barrel clasps) that they can proudly wear home. Explore some of the organisms that live in marine habitats. Introduce the concept of classification. Learn different types of shells and how they are formed. 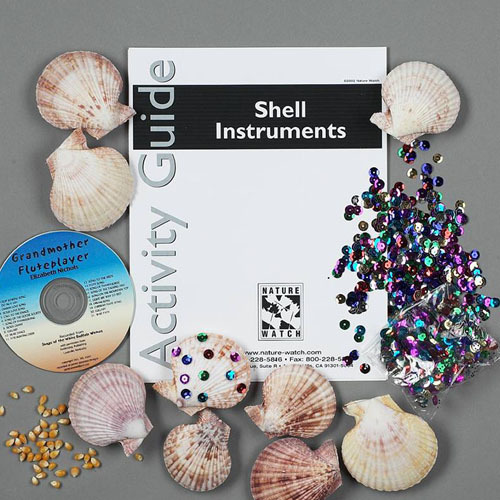 Work in teams or individually to classify and learn about different types of shells, then identify and take one home. 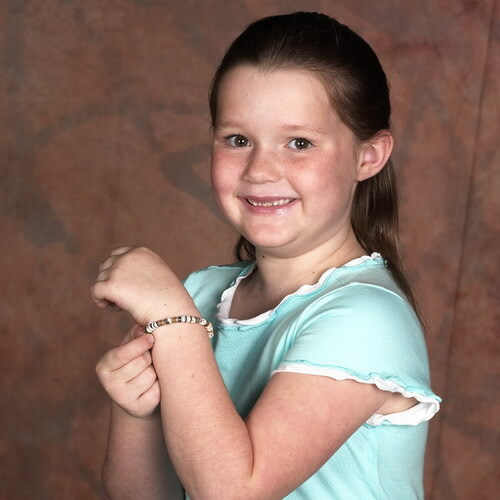 Create a bracelet using real seashells to reinforce the learning experience and make a great craft project! 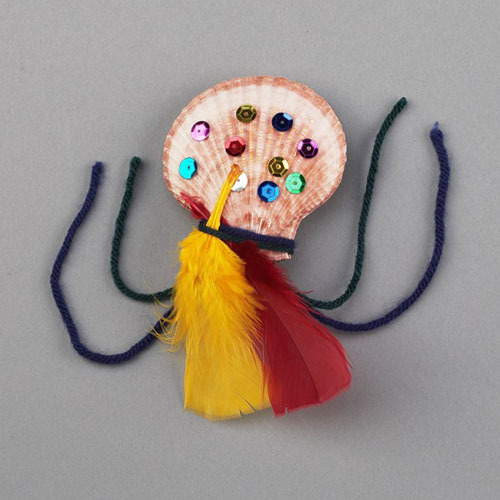 This activity combines wonderful information about ocean life with a beautiful craft project made of natural materials. Children (and adults!) 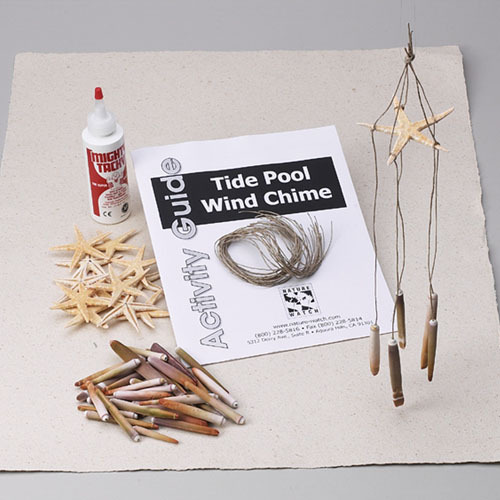 are fascinated by sea life and they will love to create and take their very own tide pool wind chime. Each participant gets a small sea star and 5 sea urchin spines. Dip the cord into glue and then into the hole atop each urchin spine. 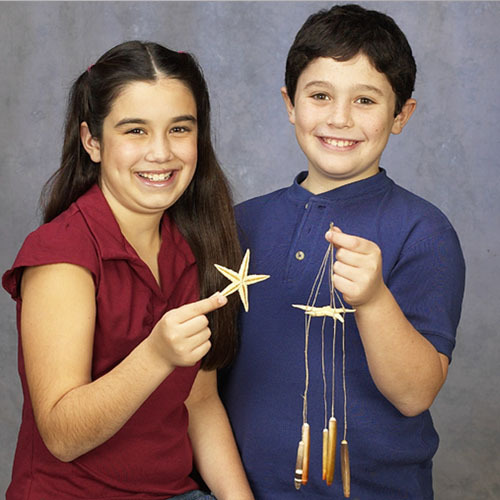 Tie on to each leg of the sea star and there you have it… an all natural wind chime that looks and sounds great. Discover the different areas of a tide pool, what animals and plants live in each, and why. Learn interesting facts about different tide pool specific species. 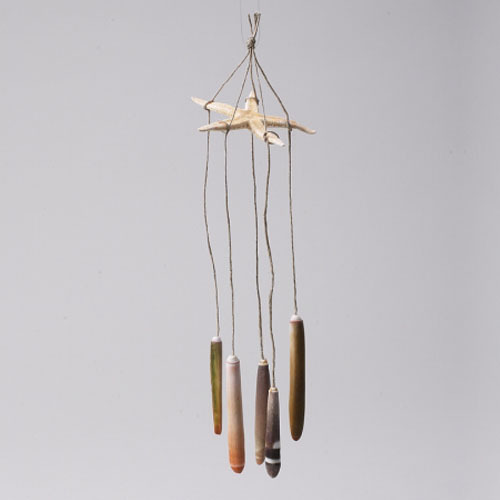 Gain a further understanding of the tide pool and its organisms by creating a tide pool wind chime using a starfish and sea urchin spines. 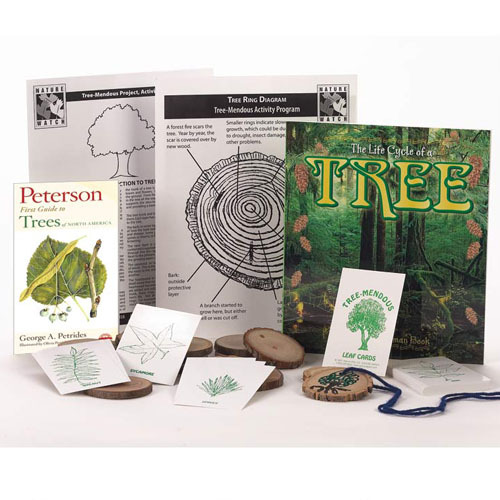 Our Tree-Mendous activity helps kids learn to identify and explore a variety of different types of trees in your area. What do they look like? How do they grow? How old are they? How do leaves differ from one another and why? Why are we so dependent upon trees? Use all of the senses to increase awareness of diversity of trees. Study the life history of trees by reading tree ring clues. Identify leaves from different trees. 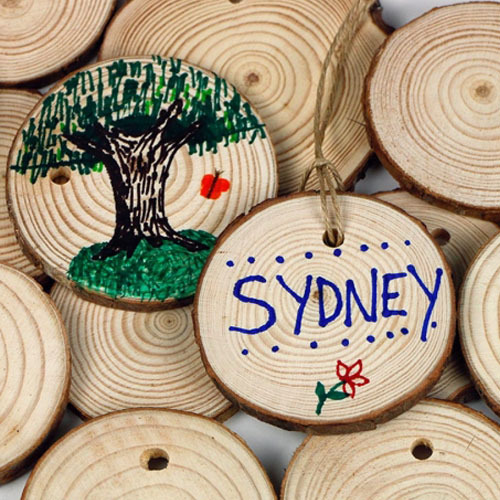 Create an art project with a tree disc. Most children have planted seeds and observed a plant’s life cycle as the seedlings grew up through the soil and became adult plants… but that’s only half the story! With this incredible activity, each participant plants their seeds in their very own Root Observation Station. 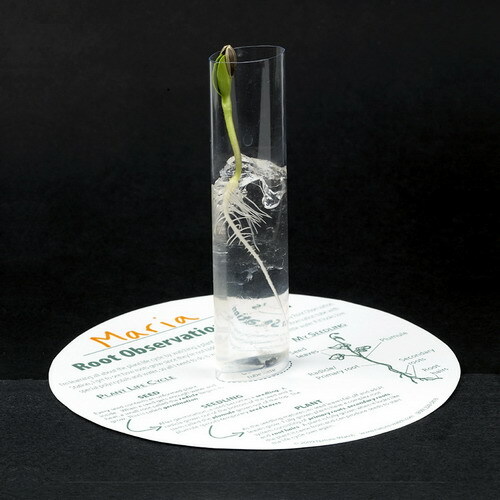 This clear tube along with a special polycrystal (instead of soil) allows the sprouting process and root growth to be visible. From seed to first sprout, all the way to budding and flowering, participants will be amazed as they watch the root growth and development take place right before their very eyes! 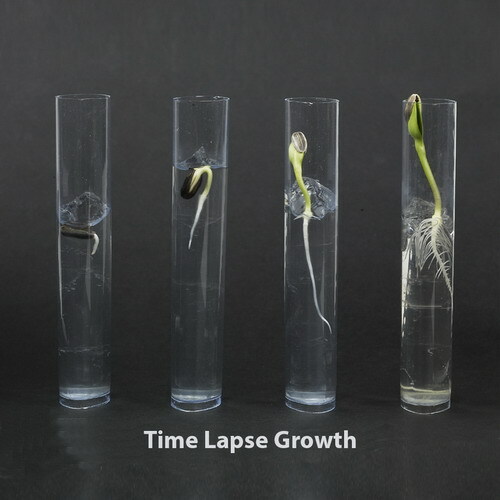 See a plant at all the stages of its life cycle. Discover the functions of all plant parts. Observe the plant’s roots and learn how they grow. Real pinecones and seedpods to compare and contrast! 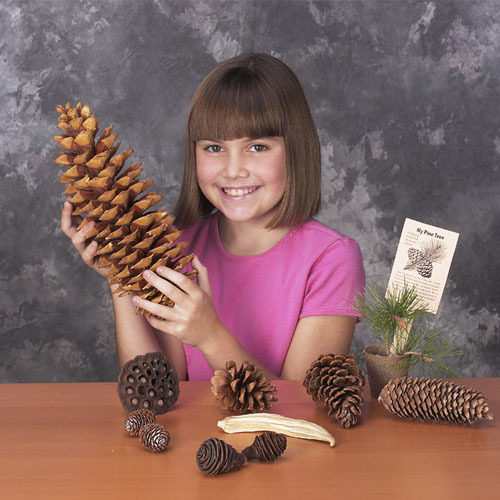 Real pine seeds to plant and take home! Real pine nuts to taste! The earth’s forests are being depleted faster than they are being replenished. Deforestation is a major environmental issue as cities and roads have been built in areas that were once home to thriving forest ecosystems. This impacts not only the trees and plants, but also all of the wildlife that depend on the forest for their food. 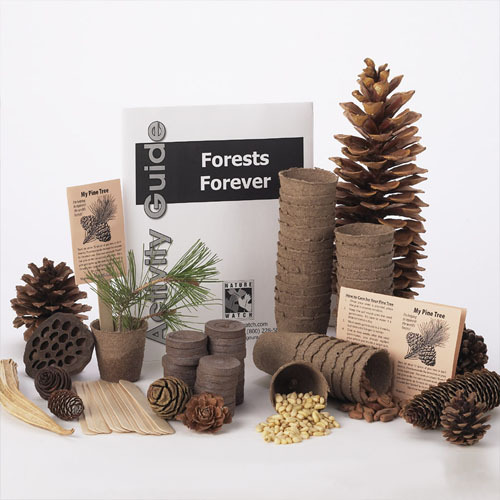 Children will become involved in replenishing the forests with this great activity! WARNING: This kit contains tree nuts. Please be aware of any participant who may be allergic. Teach children about the importance of our forests. 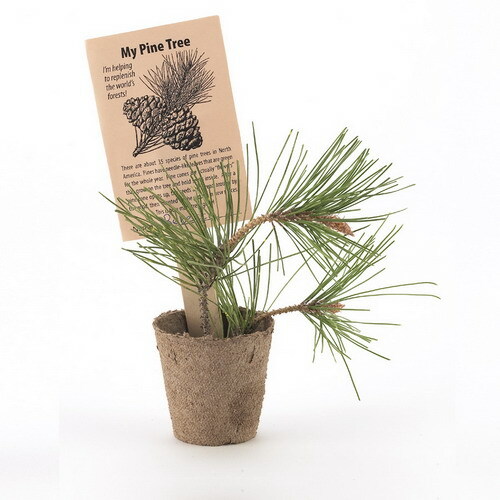 Play a role in helping to replenish the forests by planting a pine tree seed. Encourage children to care for their Pine trees until they become a sapling, and hopefully one day will replant it outside. Eat pine nuts for a little “taste” of the forest. 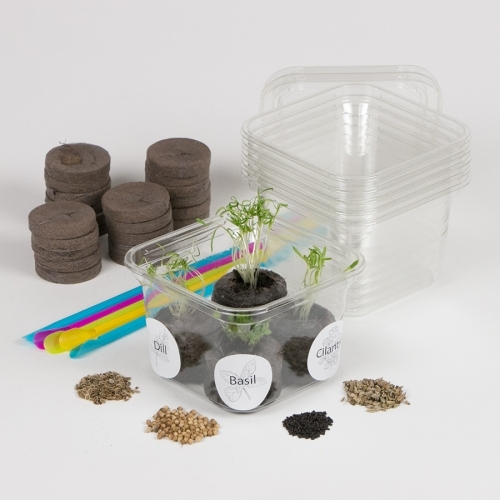 Start your very own herb garden at any time of the year! For thousands of years, herbs have been grown both to flavor foods and, in many cultures, for their health benefits. In this Herb Garden Greenhouse activity, each child will grow 4 different herbs in their own little greenhouse. Participants compare and contrast the 4 different seed types (usually Basil, Dill, Fennel and Cilantro), monitor the time it takes for each seed to sprout, and learn a little bit about the health related benefits of each herb. Place your greenhouse near a window, and (watering occasionally) watch as the seeds sprout into plants. When they reach the top of the greenhouse, they are ready to plant outside! The entire process takes about 3 weeks; but one of the seeds will sprout within the first few days. Can you guess which one? There are fish fossils embedded in the rocks on top of Mt. Everest. That single fact communicates the amazement and fascination with the study of Earth Science. 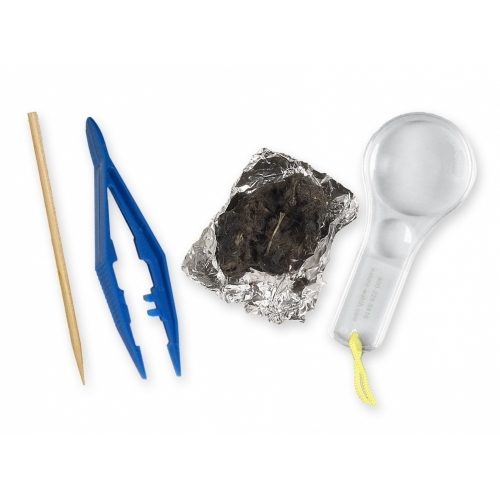 Kids become geologists in this Rock-o-Rama activity. We set up a quarry for collecting different rocks and minerals. 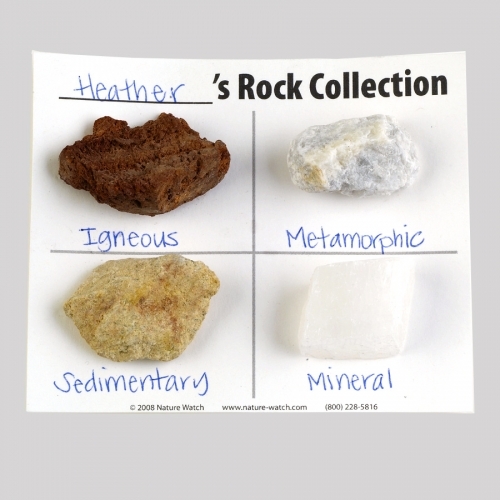 Working with their fellow scientists, the kids identify and classify specimens, then get to take home the rocks they have identified and labeled using their very own rock collection cards. This is a real hands-on way to introduce kids to the wide variety and beauty of rocks around the world. Introduce the classification system of rock & mineral types. Illustrate diversity of rock types. Become “field scientists” and look for specimens. 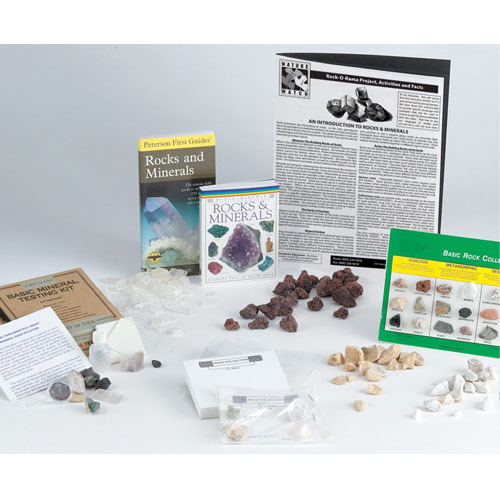 Use observational skills to classify & test rock & mineral specimens. Prehistoric Amber is tree sap that has fossilized over millions of years! Leaves, flowers and insects have been found trapped inside and scientists have learned a great deal about prehistoric times by analyzing the DNA of these little extinct creatures perfectly preserved by the hardened resin that surrounds them. (Just like in the movie Jurassic Park!) In this activity, each child receives their own piece of real Colombian amber to polish and take home. 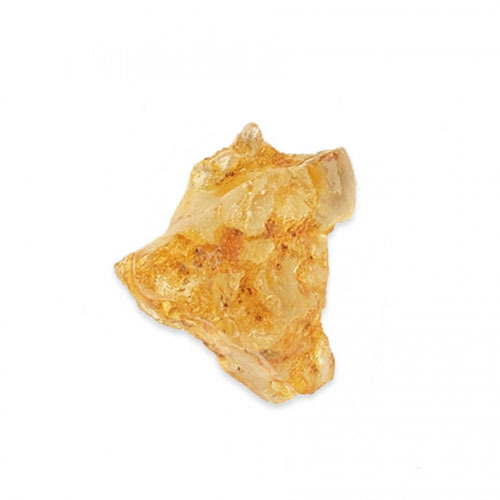 (It could be amber or copal, which isn’t quite as old, but either way it’s really millions of years old!!!) The amber comes in its natural state (dull and ” crusted”). With simple tools, students remove the crusty shell and polish the piece into a smooth, lightweight golden gem. If you polish a piece really well and look closely, some even contain an insect! 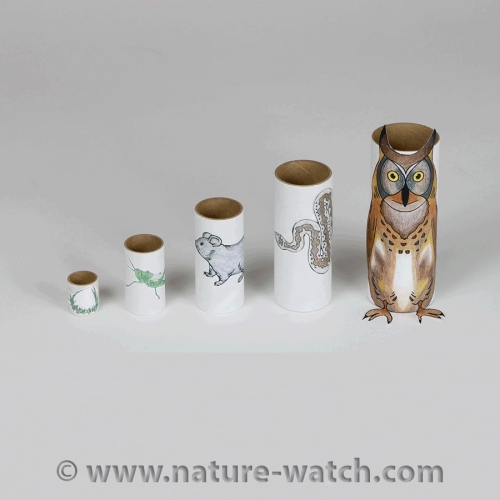 This is a unique way to present prehistoric times to kids and a great project indoors or out. The amber can be polished in anywhere from 30-45 minutes or more depending upon the piece and the shininess desired! Discuss amber – how it is formed and why it’s so special. Provide each participant with his or her own piece of REAL Colombian amber to polish and take home. Learn about “inclusions” – objects from millions of years ago that can be found inside amber today! Share interesting stories about amber and amazing amber facts. 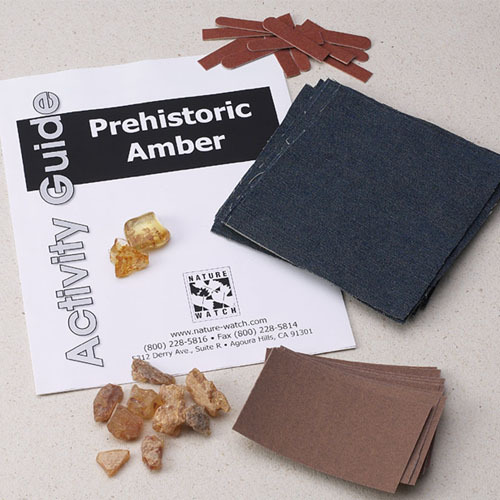 Discover tests that you can do to test for real amber. Did you know that some dinosaurs had as many as 900 teeth?! Or that a dinosaur tooth fossil was found measuring more than a foot long! 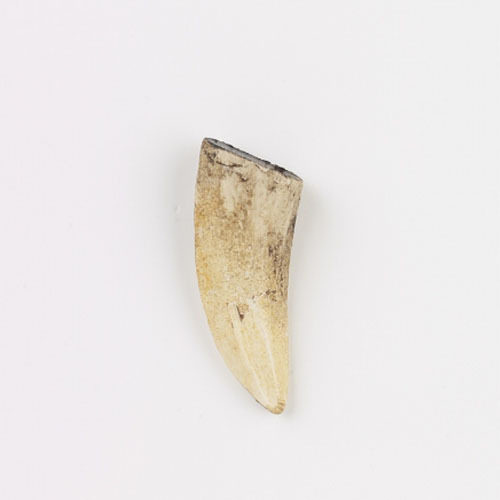 Tooth fossils provide scientists with a great deal of information about how dinosaurs lived, what they ate, their size, and even their behavior. 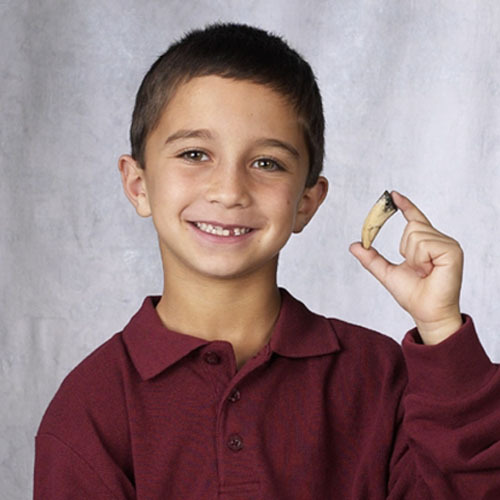 Kids won’t believe it when they each receive a Tyrannosaurus Tooth replica of their very own. Paint or color the tooth, attach the included adhesive magnet on the back and they’ve made a prehistoric souvenir to reinforce their learning (and to stick on their refrigerator at home!) 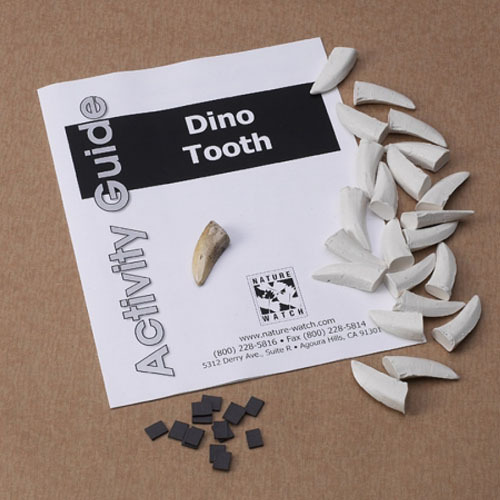 This activity is packed full of dinosaur learning and fun! Introduce participants to dinosaurs of all varieties – large and small. Compare and contrast herbivore and carnivore dinosaurs and learn what made them different. 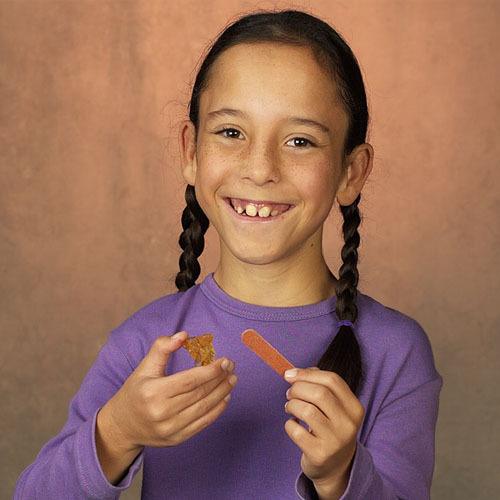 Share information about dinosaur teeth and eating habits. Paint or color a T-Rex tooth replica magnet. The best way to learn the anatomy of a dinosaur is to build one. With the Dino-Bonz activity, kids have the opportunity to build their own T-Rex, complete with the key bones that hold it together! 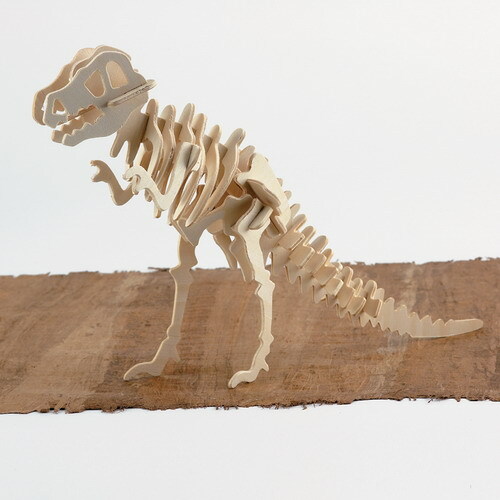 The completed T-Rex stands over 9″ inches tall and rules any dresser or desktop. Learn about the T-Rex, the most well-known carnivore of the Cretaceous period. Understand the important parts of a T-Rex skeleton by putting together the puzzle. Compare the bones of a dinosaur skeleton to those of a human skeleton. It took Jean-Francois Champollion 14 years to translate the Rosetta Stone and break the hieroglyphic code. Kids can decipher Egyptian history in a few minutes by using the keys provided and Nature Watch’s own Rosetta Stone. 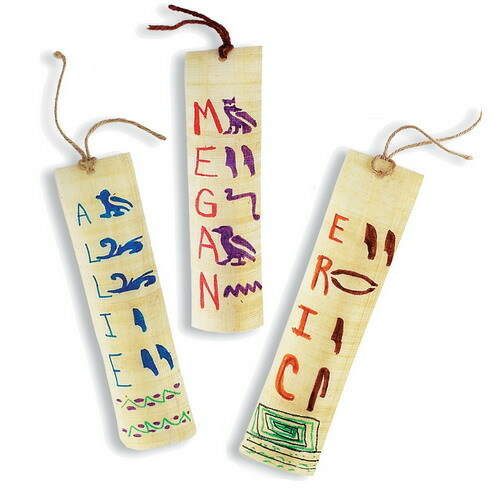 They also get to create bookmark out of real papyrus (imported from Egypt!) that carries their own secret message. This incredible project introduces students to many academic and scientific disciplines. Define and experience the science of anthropology. Develop cooperative skills through group inquiry. 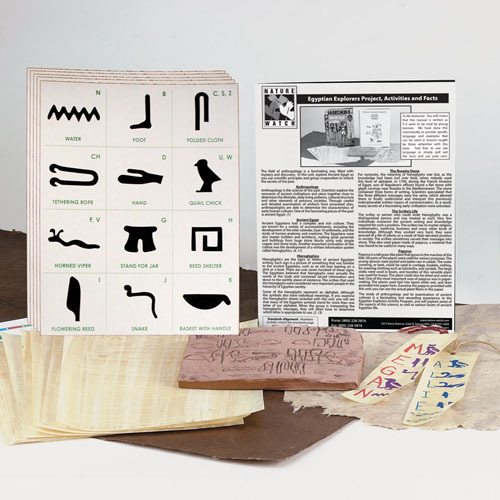 Decipher Egyptian symbols to uncover a secret message. Use hieroglyphics in a papyrus project. Mystery objects – participants can use their imaginations to see how items would be used in different civilizations. Compare and contrast leaf shapes and arrangements and discover one of nature’s most amazing phenomena – photosynthesis (simplified for kids). 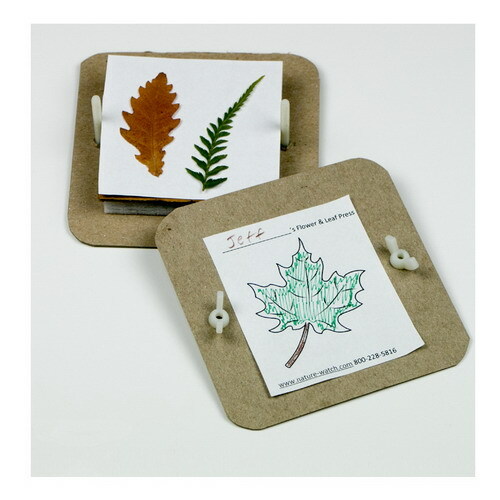 Each participant will make and take a gorgeous pressed leaf coaster of their very own! Identify the parts of a leaf and their functions. Classify leaves and trees based of different criteria. 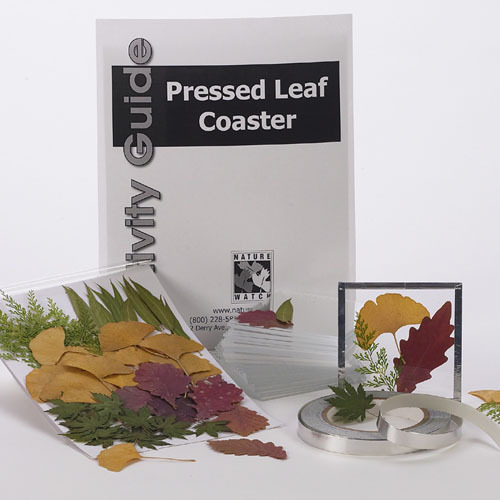 Create a leaf coaster using a variety of different leaves. 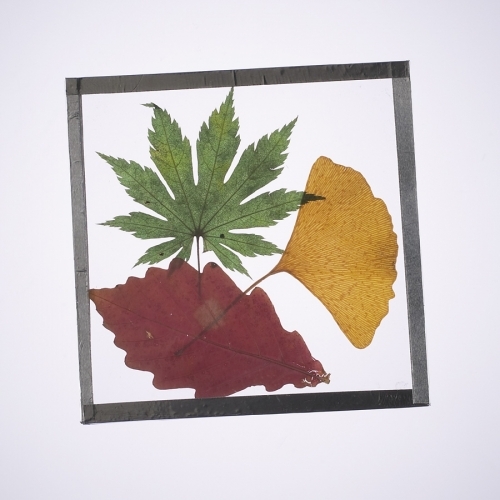 Did you know that leaf and flower pressing began thousands of years ago? There is evidence of pressed botanicals going as far back as prehistoric man and in Egyptian Tombs. Flower pressing was very popular during the Victorian era over 150 years ago when elaborate pressed collections became known as “the language of flowers”. Giving and receiving pressed leaves and flowers as gifts was so meaningful, they considered it to be almost like its own language. Pressing plants is a truly wonderful connection of science and art. Each child makes and takes home their own press! 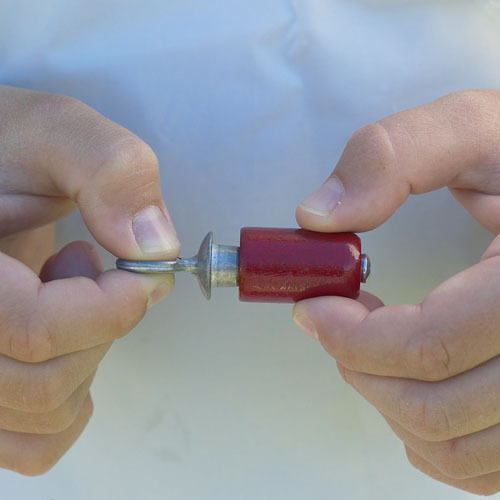 Students can place the leaf or flower into the 5″ x 5″ press, then tighten the plastic screws to apply the pressure needed to press the specimen (no tools required). After about 3 weeks, your leaf or flower will be beautifully preserved! 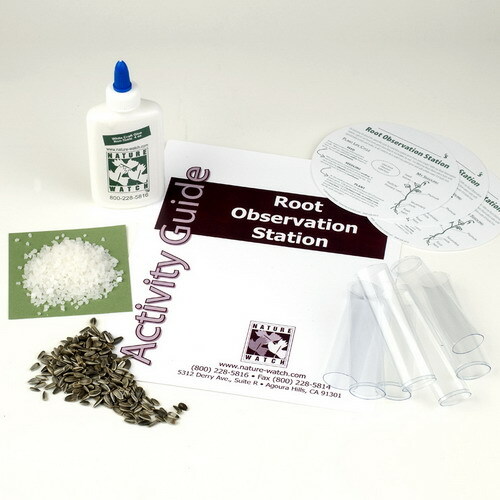 Gain a better understanding of plant structures. Appreciate the diversity of plants in your local area. How can you tell what an owl ate for dinner? By studying the bones that are left over! Just as you throw away your chicken bones, owls “throw away” the remains of their meals by coughing up a pellet containing the bones and fur of their prey. 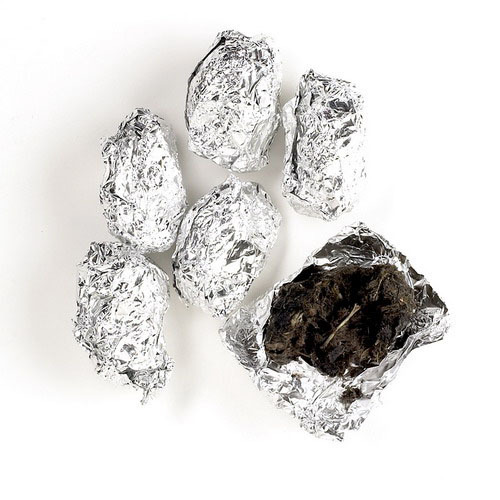 Barn Owl pellets can be studied to learn about an owl’s diet, habitat and food chain. Owl pellets have been carefully sterilized to ensure safety. 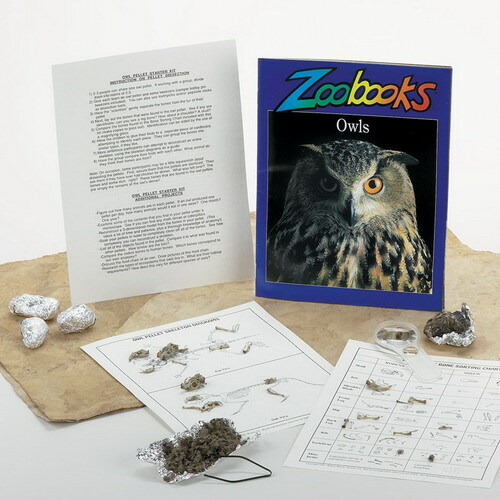 Owl Pellet dissection is a terrific activity conducted in thousands of classrooms each year and is a perfect “hands-on” scientific experience for the young biologist. Animals communicate in a variety of different ways–people speak, wolves howl, gulls use their bodies in a physical display, and some mammals even communicate through smell. But there is no more distinctive form of communication than the beauty of a bird’s song. This wonderful activity teaches participants about the many different forms of animal communications and focuses on bird songs. Participants assemble and take home their own Audubon Bird Call! First they paint the birchwood piece, then they dip the metal instrument into powdered rosin. 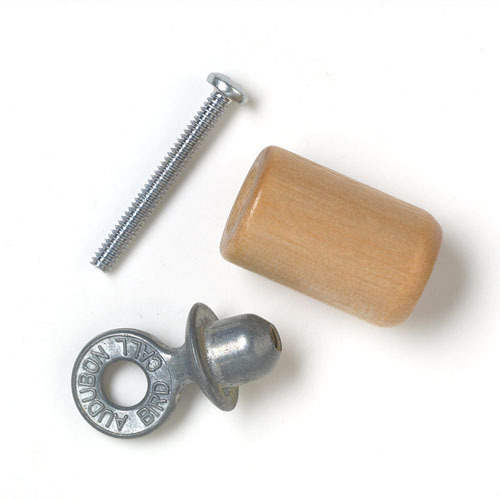 Using a simple screw they assemble the call which, when turned, creates a beautiful bird song sound. Wild birds are attracted to the sounds of the call and they may even sing back! Learn about the various means of communication used by all different types of animals. Discover how birds are able to produce their calls. Assemble an Audubon Bird Call that will allow you to attract and observe birds. Long before mechanical clocks and watches were invented, people used sundials to tell time. As the sun moves across the sky, the shadows it casts change their position. By marking where the shadows fell, people learned how to tell the time of day. 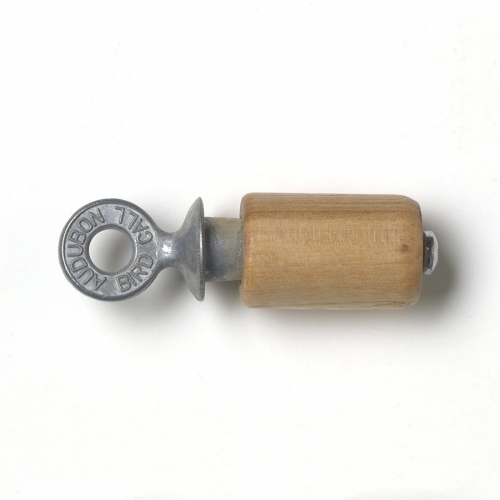 This cylinder or ” shepherd’s” dial was widely used hundreds of years ago because it was inexpensive, simple to make and easy to carry. (Even George Washington carried one is his pocket!) Forget digital watches! Kids will love to make a natural time-piece of their own. Learn about how sundials were “discovered” and how they’ve been used for a long time. 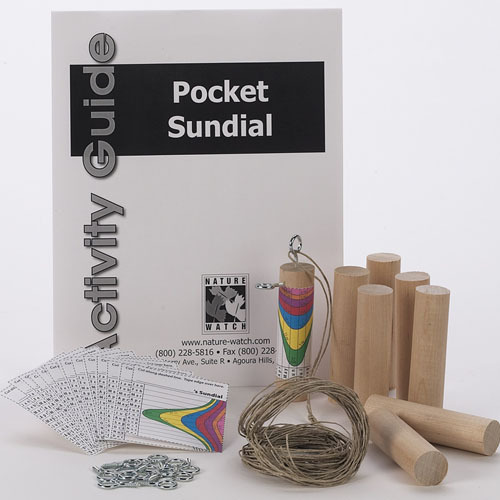 Construct a real sundial that participants can use to tell the time. 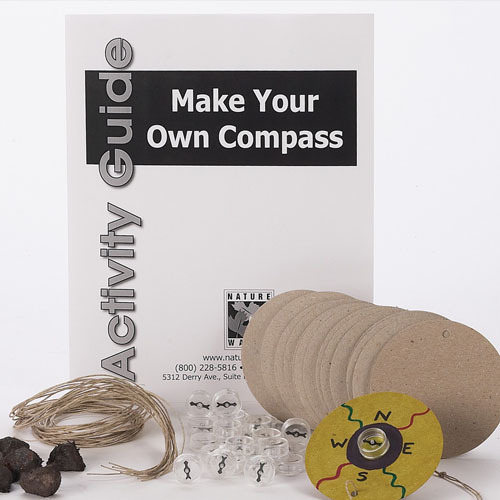 Make your own compass and experiment with real Lodestone, the naturally “magnetized” rock that enabled the invention of the first compass! 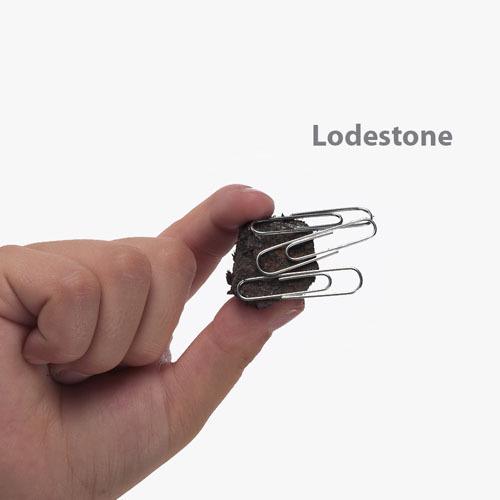 Lodestone, often referred to as magnetite, is a naturally magnetic stone which led to the invention of the first compass almost 2,000 years ago. As a navigational aid, the compass enabled ocean voyagers to travel to specific destinations like never before. Lacking the compass, the great voyages of discovery may never have taken place–Columbus, De Gama, Magellan and all the rest. The history of the world might have been quite different! 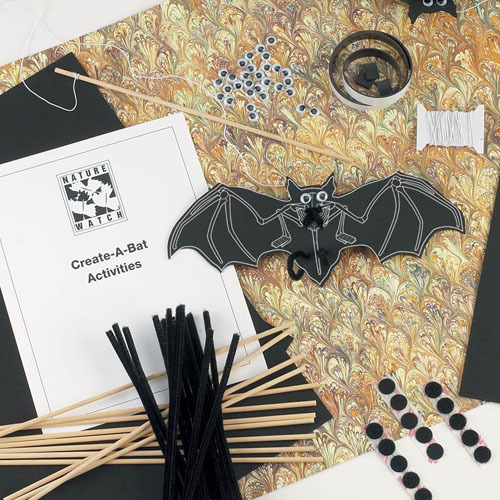 Kids will enjoy all 3 phases of this unique activity! First, they will explore the magnetic qualities of lodestone by experimenting with metallic and non-metallic materials! Next, the whole group will build a simple working compass. Finally, each participant will make a real, working compass necklace of their very own. Discover what lodestone is and how it led to the creation of the compass. Learn about magnets and the magnetic properties of the earth. 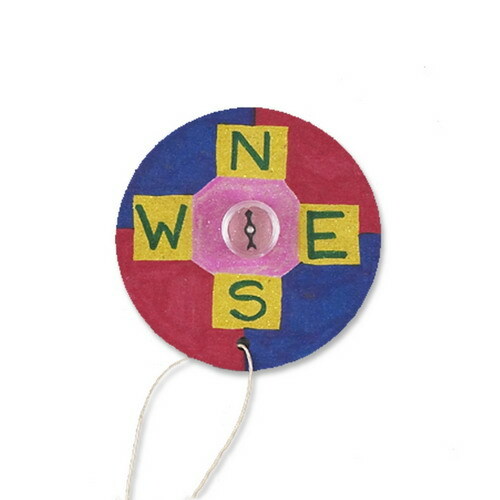 Demonstrate the magnetic properties of lodestone with the materials we include for a large, ” group” compass. 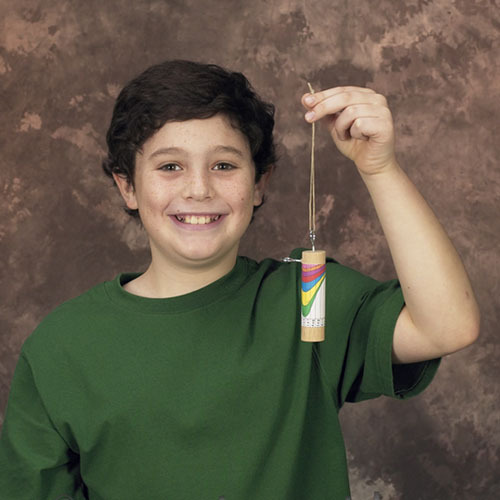 Create compass necklaces that each participant can use and take home. Children love rainbows! 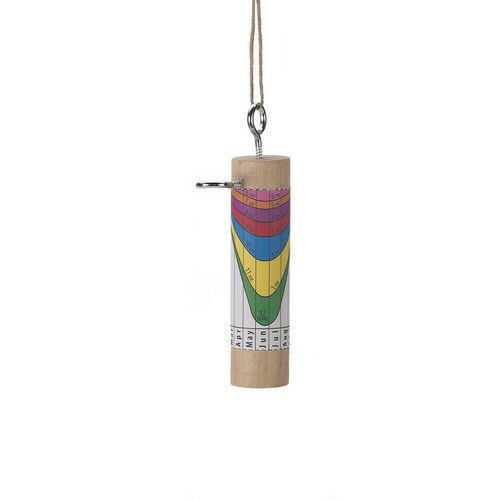 Younger children enjoy seeing the array of color and learning the order of the color spectrum while older children are fascinated to learn more about the physics of light and color. 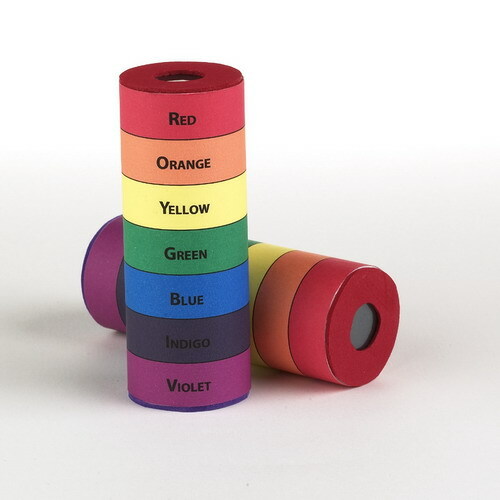 The Rainbow-Scope activity allows children to make a spectroscope of their very own. First, place one piece of the diffraction grating over one end of the tube. Then glue the custom die-cut foam pieces to each end. 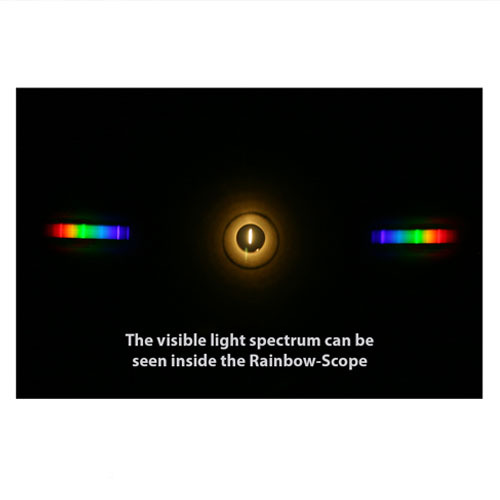 Look through the scope at any light source and see light separated into its component colors (also known as a rainbow!) Color the outside appropriately and there you have it, a rainbow-colored, Rainbow-scope! Older kids can view a variety of different light sources and compare and contrast the various color bands that are emitted. Introduce the important concepts of color and light. Understand why and how we can see color. Experiment with light using a prism. 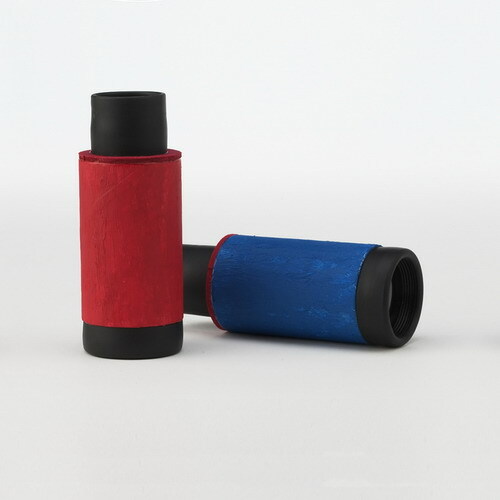 In the Make Your Own Monocular activity, participants “make and take” a real, easy to assemble monocular with 3x magnification! Children simply glue the ocular and objective lenses to each end of the tube. 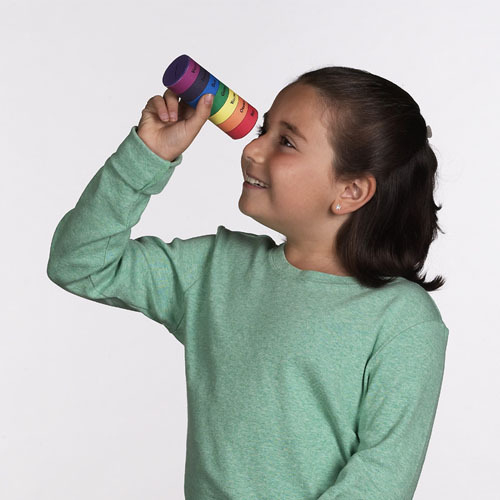 Younger children (ages 6-8) will paint and decorate their monocular tube while older children (ages 8 and up) will color-in and attach a diagram illustrating the physics of magnification (simplified for kids.) Children will learn the basics of magnification, and will be delighted as birds, trees and butterflies seem to leap out from the background right before their eyes! 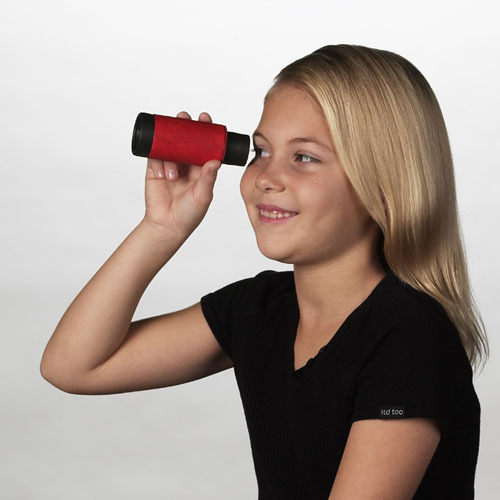 Create an actual working monocular. Discover the properties of light that allow lenses to work. Observe the environment through monoculars. Here’s a great way to learn about cloud identification and classification! 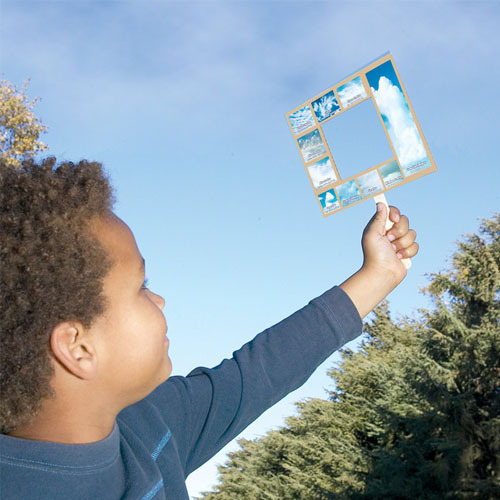 Each child makes their own Weather Window – a hand-held frame with a variety of cloud types classified by altitude. 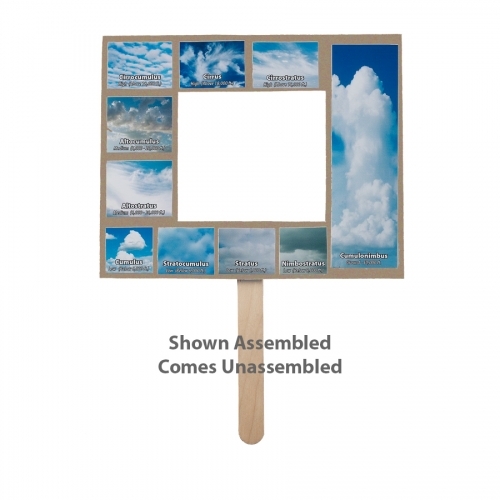 Participants will cut out each cloud picture and glue them onto their very own Weather Window! Then, they can match real clouds to the photos, identify the cloud type, and discuss what type of weather might follow as a result. Discover clouds and weather in an exciting way. Classify types of clouds and learn the weather they bring. Make a Weather Window that can be used to identify clouds and predict weather. 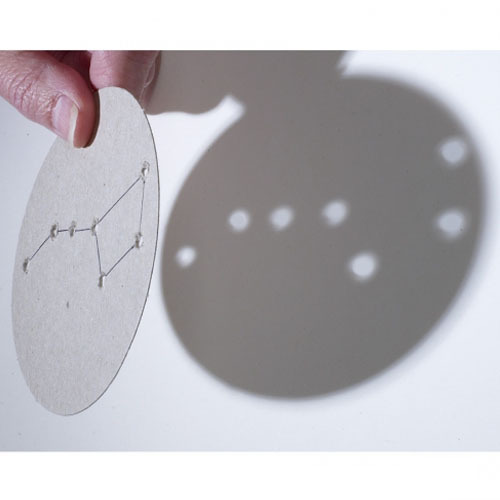 How can kids learn about constellations during daylight hours? Here’s how! 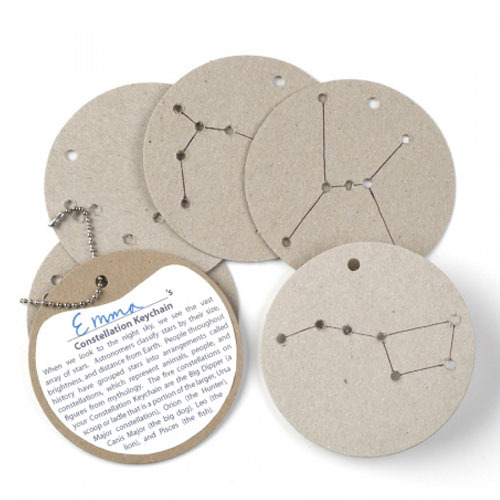 These professionally die-cut cardboard medallions have holes to represent each individual star in a constellation. When light shines through the medallion, the image of the constellation appears. This can be done indoors using a single bulb flashlight to make the constellation visible on the wall or ceiling, or can be done outdoors on a bright sunny day to see the constellation on the ground. Constellations included are: Ursa Major (Big Dipper), Orion (the hunter), Leo (Lion), Pisces (fish), Canis Major (dog). “See” the stars during the day. 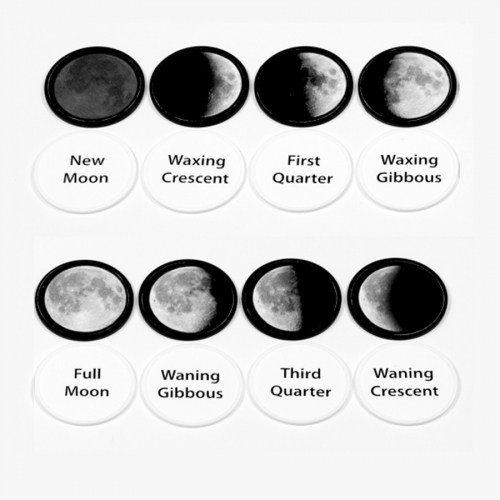 Understand the role that stars and other celestial bodies play in our universe. Discover the mythical stories behind the constellations. People have been fascinated by the sun for thousands of years! The sun is the center of our solar system and is the driving force of life on Earth. We rely on the sun for light, heat, food, water, energy and more. Historically, many cultures even worshipped the sun! 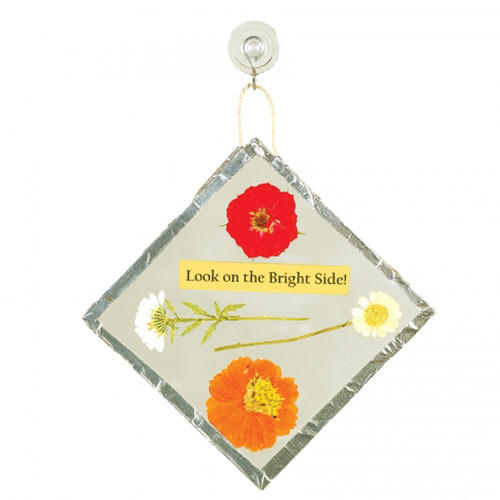 In our Here Comes the Sun-Catcher activity, each participant assembles and hangs their very own suncatcher. First, each child selects pressed flowers from a beautiful assortment. Next, they place the flowers between 2 crystal clear 4″ plastic squares and wrap a shiny piece of foil tape around the edges. Finally, they will attach a piece of hemp string and hang the suncatcher in a window using the included suction cups. When the sun shines in the window, this beautiful craft will be a reminder of the things they learned about the sun! 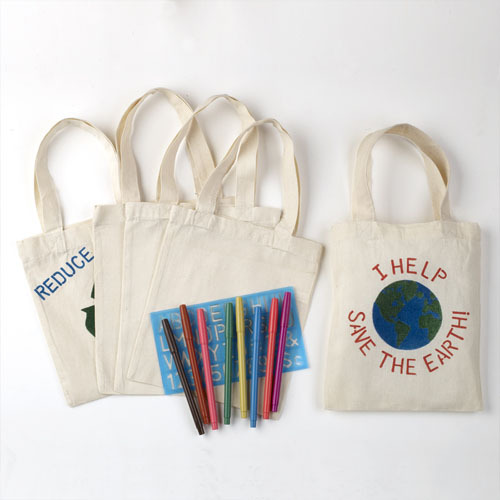 Teaching basic ecology to children is an important first step in encouraging them to become stewards of the environment! Every human, plant, and animal depends on water for survival which is why it is so very important that children have a basic understanding of this difficult concept. 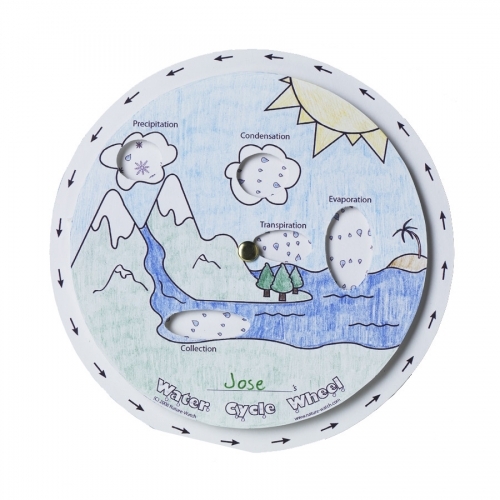 The Water Cycle Wheel activity makes it easy for children to learn about the water cycle. Children color the illustrated, die-cut sheets and label each step of the simplified cycle: evaporation, condensation, precipitation and transpiration. Assemble the wheel, rotate it counter-clockwise and the water cycle is modeled right before your very eyes! Discover how the water cycle plays an important role in our ecosystem. Define and learn about the processes that make up the water cycle. 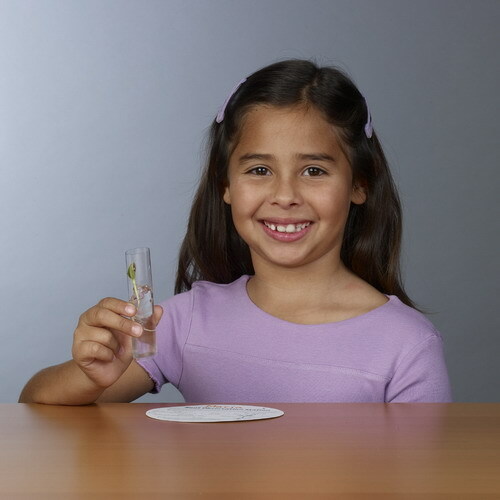 Make a Water Cycle wheel to illustrate the water cycle.